Defra has set out the expectation that Ofwat “promote ambitious action to reduce leakage and per capita consumption”. This has translated into per capita consumption targets forming part of the mandatory performance commitments in PR19. Introducing a water label could be a cost effective mechanism to deliver significant water and energy efficiency across every UK household. International experiences show that a water label can form a key element for policies relating to new buildings and retrofitting homes (figure below). There are also opportunities to consider a combined water and energy label and benefits this could have to water and energy efficiency as well as household bills. In January 2018 the Government published A Green Future: Our 25 Year Plan to Improve the Environment. This document outlines the Government’s intentions to “work with the industry to set an ambitious personal consumption target and agree cost-effective measures to meet it”. The plan also sets out that the government will work with a group led by Waterwise to improve water efficiency and customer involvement to explore the impact of introducing new water efficiency measures. This project contributes to delivering this commitment. 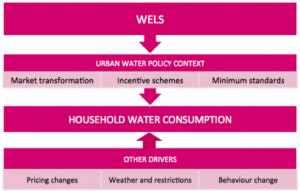 Whilst water companies are increasing the scale of water efficiency initiatives, there are a number of policy and regulation changes that have a role to play in setting and meeting future ambitious per capita consumption targets. Introducing a water label to drive market transformation and consumer purchasing behaviour is an option preferred by water companies because it could help them to work with others such as developers and local authorities to reduce water consumption. We need to test this approach. 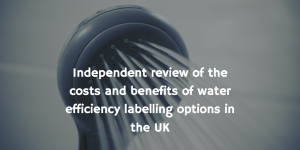 Waterwise are leading a project funded by Defra and the Collaborative Water Efficiency Fund to deliver a key action from the Water Efficiency Strategy for the UK on reviewing water labelling options. The Energy Saving Trust has been chosen as the partner to deliver the research on policy options, cost benefit analysis and a practical way forward. Based on international experience an effective water labelling programme linked to wider building regulations and water efficiency initiatives can significantly help reduce demand for water. This will be needed to help the UK meet ambitious reductions in PCC and important in the context of a new ISO standard being developed for water labelling. Stakeholder engagement will be a key part of the project and please get in touch if you’d like more information.